Launchpad(s aapl), the new app launcher in Mac OS X Lion, can be useful for hunting down apps you don’t use very often. However, sometimes it can feel bloated and difficult to navigate. Here are a few tips to make Launchpad a bit easier to work with. Mac App Store apps that are in your Launchpad can be moved by clicking and holding their icons, and deleted then clicking the ‘x’ that appears in the corner of each icon. It’s possible to delete and move them without waiting for that delay, though. Instead of clicking and holding an icon, simply hold the Option key on the keyboard. The icons will start to wiggle instantly, and you’ll be able to delete and move the apps. You can also move the icons without them being in the ‘editing mode’. You can move them around simply by clicking or tapping and dragging; the icons don’t have to be wiggling to be moved. If your Launchpad is anything like mine, it has all sorts of applications listed that you’d rather not see, such as Adobe help apps, or uninstallers. If you’d like to only have Launchpad show the apps you actually use, you can clear Launchpad completely and add the apps manually. It may be time consuming to add all the apps again, but it should stop Launchpad feeling so bloated. First off, make a backup of the current Launchpad database. That way, if something goes wrong, you can restore Launchpad back to how it was. To do this, open [Your username] > Library > Application Support > Dock and make a copy of the file that’s in there. In order to get to the Library folder, you may have to use the Finder’s Go menu with the option key held down, since Lion hides it by default. Launchpad should now be empty. You can add apps back in by dragging them from the Applications folder onto the Launchpad icon. If you’d like to restore Launchpad to how it was when you first installed Lion, simply delete the file you made a copy of from the Application Support > Dock folder. Next time you launch Launchpad, it should be back to normal. If you’d rather not delete everything from Launchpad, or you aren’t comfortable using the Terminal, there is a preference pane you can download which allows you to select certain apps to hide from Launchpad. It’s called Launchpad-Control, and can be downloaded from this website. Once you’ve downloaded and installed the preference pane, you can find it under “Other” in System Preferences. 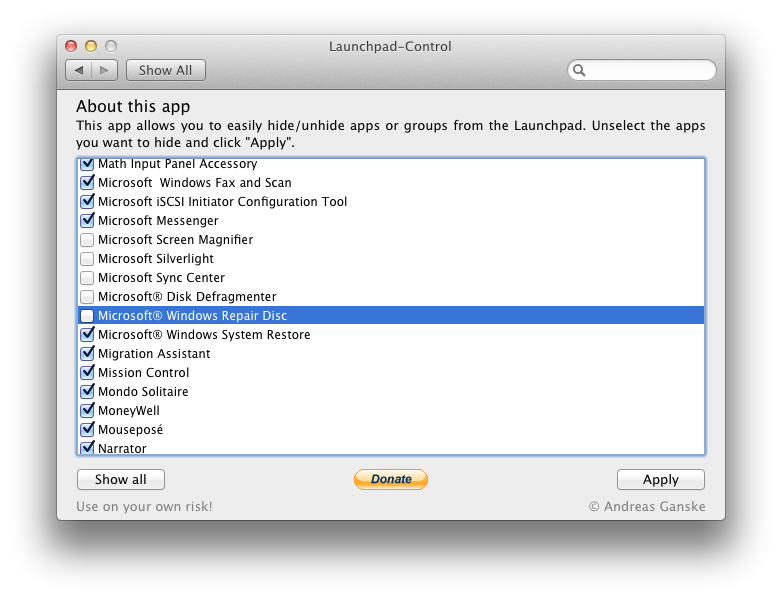 In the Launchpad-Control pane, you’ll find a list of apps that are currently in Launchpad. You can uncheck the box next to an app’s name to hide it from Launchpad. Click apply, and you’ll briefly see the Dock disappear. Once it returns, open Launchpad and the apps you unchecked will no longer appear there. Unless you bought a Mac after Lion was released, your keyboard probably doesn’t have a shortcut key for opening Launchpad. It’s very easy to set one up using System Preferences. 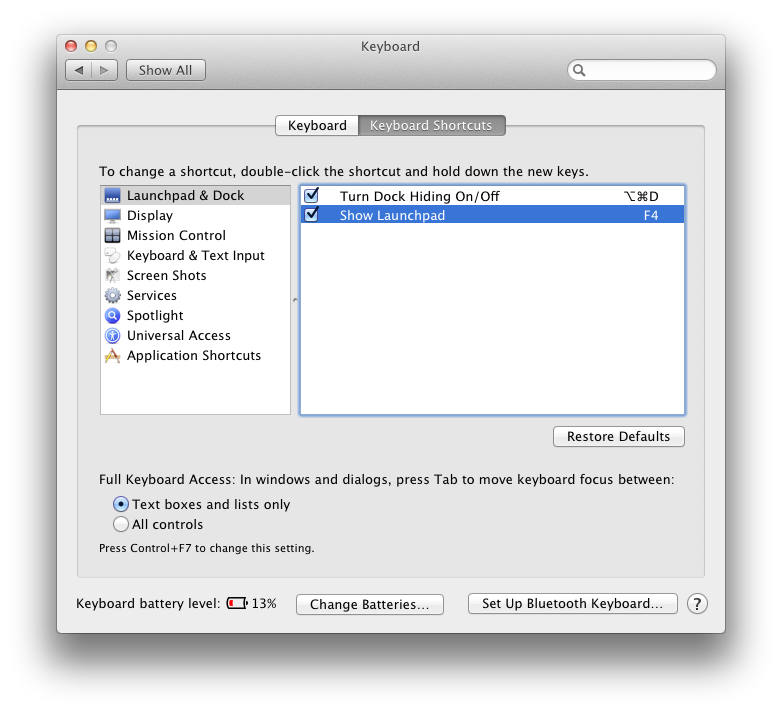 Open System Preferences and open the Keyboard preference pane. In there, select the Keyboard Shortcuts tab. From the source list on the left, select Launchpad & Dock. Now find Show Launchpad from the list on the right. Double-click on the right hand side of the entry for Show Launchpad. A small text field should appear. Now type the shortcut you’d like to use for showing Launchpad. You can now use that shortcut to show and hide Launchpad using your keyboard. Especially f you don’t like having Launchpad in the Dock, this makes it much easier to open it. You could even remap the Dashboard key to open Launchpad, if you wish. Do you know of any other time-saving or organizational tips for Launchpad? Tell us below in the comments. Even easier to access lauchpad if you make it a hot corner. This article was helpful and interesting, by the way. Oops, that’s meant to say “Especially if”. I used BetterTouchTool to map a three-finger-click gesture on my MagicMouse to launch Launchpad. Works great!